A guide to the history of The University of Montana-Missoula. The University of Montana-Missoula yearbook was called The Sentinel. It was published annually from 1904-1972 and again from 1987-1989. The Sentinel has been digitized and is now available online. The Kaimin began as monthly publication in 1898. In 1908 it became a weekly and eventually a daily publication. In April 2015, due to a budget crisis, the paper returned to publishing once a week and online. The 1905 ASUM student handbook lists the university’s official colors as copper, silver and gold. At the time, it was difficult to get fabric in metallic colors and students wanted to wear their school spirit so “spirit colors” of maroon, gray and yellow were adopted. Read More. The dual color system continued until 1967 when the colors were changed to orange and yellow. In 1996, the colors were changed back to maroon and gray. Archives & Special Collections has thousands of photographs of the university. Check out our online photo collection and contact us if you can't find what you're looking for. The University of Montana-Missoula has a long and rich history full of interesting stories. 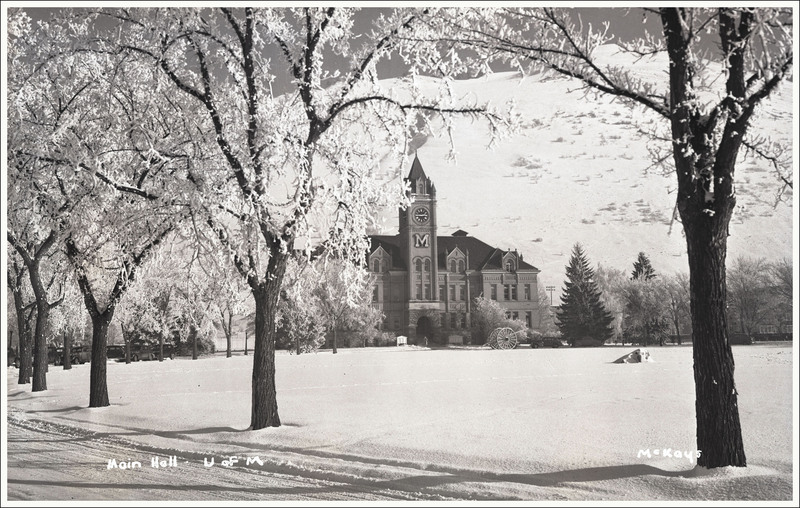 The Montana state legislature authorized the creation of the university on February 13, 1893 and two years later, on September 11, 1895, it opened. Classes were held on the grounds of what is now Willard School until the university moved to its current location in February of 1899. The first graduation ceremony occurred in June 1898 for Ella Robb Glenny and Eloise Knowles. In 1900 the university’s motto Lux et Veritas, meaning light and truth in Latin, was adopted. This guide is broken up into eight parts: University Presidents, Faculty and Staff, Students, Departments and Schools, Organizations, Athletics, Campus Grounds and Buildings. Each page includes a list of resources available online and in person at Archives & Special Collections. In addition, several pages have general historical information on university traditions and campus features. The information found in this guide has been pulled from multiple sources and represents a small sample of the materials held by Archives & Special Collections related to the university. To offer an addition or correction, please contact Archives & Special Collections. If you can’t find what you’re looking for please contact us by email, phone (406) 243-2053 or stop by. We are open Monday-Friday 9-5, located on the fourth floor of the Mansfield Library and we are always happy to help. Each item in the list below links to a guide that describes the materials found in the collection. To view the materials visit Archives & Special Collections at the Mansfield Library. The Kaimin began as monthly publication in 1898. In 1908 it became a weekly and eventually a daily publication. In April 2015, due to a budget crisis, the paper returned to publishing once a week and online. The Kaimin is an excellent source for all things UM. The digitization of the Kaimin is currently in the planning stages so check back for updates on this project. Copies of the Kaimin can be found in Archives & Special Collections at the Mansfield Library. The Kaimin is also available on microfilm on level 1 of the library. The Records of the Office of the President is more than just memos and thank you notes. It is a treasure trove of information on the university. To view the guide to the Records of the Office of the President visit Archives & Special Collections at the Mansfield Library. The University of Montana-Missoula yearbook was called The Sentinel. It was published annually from 1904-1972 and again from 1987-1989. It includes photographs and information on students, faculty, departments, events, clubs and athletics. It is an excellent source for all things UM. The Sentinel has been digitized and is available online. Copies of can be found in Archives & Special Collections and in the general collection. The University Publications collection is a fabulous resource for researching the university because it includes newsletters, annual reports, commencement programs, literary magazines, and lots of other publications created by departments across campus. To learn more view the guide to the University Publications collection. Each book listed below is located in the Mansfield Library. Click on the title for location information. Questions? Contact Archives & Special Collections for help with university related research requests. (406) 243-2053 or library.archives [at] umontana.edu.